Every now and then in astronomy we’ll get an image that lets us actually see phenomena we have previously just deduced from other observations. The image above is one of them. It was taken by the Atacama Large Millimeter/submillimeter Array (ALMA), and shows an exoplanetary system in the process of forming. This isn’t an artistic rendering, it’s an actual image. We’ve known for a while that planetary systems form along with a star. Known as the nebular model, the basic idea is that as a star forms within a large nebula (known as a stellar nursery) the surrounding gas and dust form an accretion disk around the star. Over time, protoplanets form within these disks, eventually clearing the system and becoming a planetary system such as our own solar system. We have a lot of evidence to support this model. We’ve observed stars forming within nebulae, and we have computer simulations showing how stars form an are cast out of a stellar nursery. We’ve observed protoplanetary disks around young stars, and we have computer simulations showing how protoplanets begin forming within these disks. We’ve also found lots and lots of exoplanets. So we’ve known that out in the universe there are young stars where protoplanets are actively forming, we just haven’t observed them directly. Until now. This particular image is of a star known as HL Tauri. It is a young T-tauri type star about 450 light years away. The image was taken at wavelengths on the order of a millimeter, which is particularly good at penetrating the nebular material surrounding the young star. Because ALMA is an array of telescopes spread across 15 kilometers, it can capture images with a higher resolution than Hubble. It’s the detail of this image that is astounding. Not only can you clearly see the disk, you can actually see gaps in the disk. These gaps are due to protoplanets either clearing the region of their orbit, or creating resonances within the disk to produce gaps, similar to the way Jupiter produces Kirkwood gaps in the asteroid belt. This image is crystal clear evidence of protoplanet formation, just as the nebular model predicts. ALMA is still in its early stages. In a way, it is one of ALMA’s baby pictures as it gets up to speed. 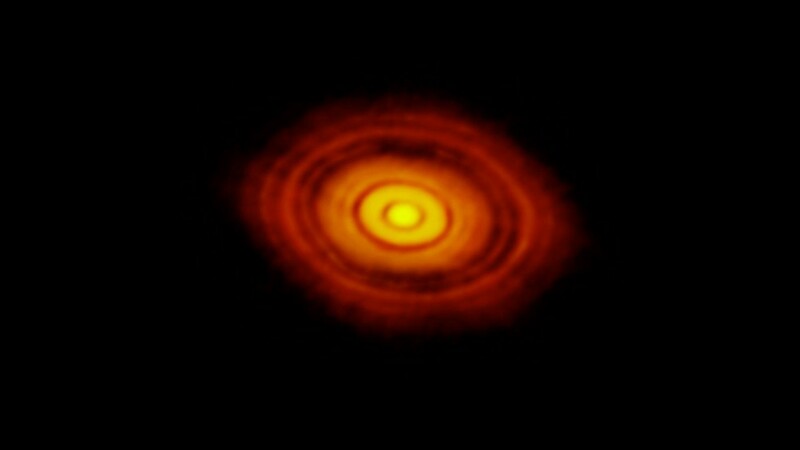 It also happens to be a baby picture of a whole new solar system. ALMA, in Spanish: Soul. Released in 2012, this 52-minute public television documentary reveals the motivations, struggles and ultimate triumphs of the people designing and building the most elaborate ground-based astronomical observatory ever, the Atacama Large Millimeter/submillimeter Array (ALMA). The program documents some of the first observations made by the telescope, foreshadowing the scientific rewards that will be its heritage. Filmed on three continents–and at altitudes ranging from sea level to 16,500 feet–the film features breathtaking views of Chile’s remote Atacama Desert, and demonstrates the lengths to which humans will go to understand the universe they call home.